Residents of Ponce, Puerto Rico, line up at an ATM in hopes of getting some cash. More than a week after Hurricane Maria struck, residents are waiting in long lines to withdraw money and for gasoline. "...Such poor leadership ability by the Mayor of San Juan, and others in Puerto Rico, who are not able to get their workers to help. They ....," Trump added. 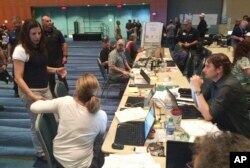 Acting Homeland Security Administration Secretary Elaine Duke flew over hurricane devastated Puerto Rico Friday and reassured residents the federal government understands the severity of the ongoing human catastrophe facing the U.S. territory. Acting Homeland Secretary Elaine Duke, left, talks to first responders during her visit, Sept. 29, 2017, in Puerto Rico. A displaced resident of Ponce, Puerto Rico, finds shelter at Santa Teresita Elementary School, Sept. 30, 2017. Ponce is one of Puerto Rico's largest cities along its southern coast. Standing water in Ponce, Puerto Rico, poses health risks for its residents more than a week after Hurricane Maria devastated the island. ​Earlier in the day, at a speech to a group of manufacturing industry leaders, he pledged to provide all possible assistance from Washington. “We’ve never seen anything like this,” he said, noting that Washington is sending 10,000 federal personnel, including 5,000 National Guard members. “We’ve closely coordinated with territorial and local governments which unfortunately aren’t able to handle this catastrophe on their own,” the president said. Trump and other top administration officials are scheduled to visit the hurricane-ravaged region, including Puerto Rico and the U.S. Virgin Islands, next Tuesday. Sailors aboard the amphibious assault ship USS Kearsarge (LHD 3) observe as an MH-60 Sea Hawk helicopter transfers pallets of supplies from the fast combat support ship USNS Supply (T-AOE 6) during replenishment-at-sea for continuing operations as part of Hurricane Maria aid efforts. A three-star general was named Thursday to head the relief effort, and a 1,000 bed hospital ship, the Comfort, departed Friday from its home port in the U.S. state of Virginia to assist in the recovery. Homeland Security Adviser Tom Bossert said 44 of Puerto Rico’s 69 hospitals have been restored to operation. But critics say the response may prove to be a case of too little, too late. Russel Honore, highly lauded for commanding the military response after another big storm, Hurricane Katrina in 2005, said the military deployments to Puerto Rico should have been started at least four days earlier. Jonathan Aponte walks with a gas can up the road to his home in the aftermath of Hurricane Maria, in Yabucoa, Puerto Rico, Sept. 26, 2017. 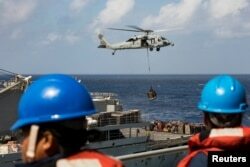 The head of the U.S. relief effort, Lieutenant General Jeffrey Buchanan, said Thursday it would be a long-term project. Amid the tragedy, Trump said the one bright spot so far has been the ability of relief and rescue crews to keep hurricane-related death toll to a minimum. 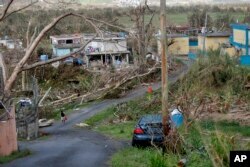 Health officials, however, say worse days and weeks may still be ahead as authorities battle the massive task of restoring clean water and sanitation, not to mention providing food and shelter for Puerto Rico’s 3.4 million people.